Kam Man Foods (aka Kam Man Market in some locations) is a five-store chain based in Edison, NJ that specializes in Chinese and other eastern Asian foods. According to Wikipedia, its name in Chinese translates to Golden Door. The original location is in Chinatown in Manhattan, while newer locations have opened in Edison and East Hanover, NJ, as well as Boston and Quincy, MA. The Boston location has since closed. The store here in East Hanover is located in a mall that was also once home to a nearly 100,000-square-foot Pathmark, although the stores were never open at the same time. The entire mall has recently undergone a facade renovation, which was in progress at the time of my visit. I first visited this Kam Man long before I got interested in supermarkets. I was blown away, especially by the produce -- so many things I had never seen before! 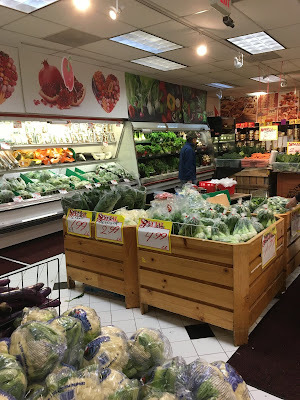 Then I actually started to visit a lot of supermarkets, and was introduced to Food Bazaar, SuperFresh Food World, Hmart, and other similar international markets. Coming back to Kam Man after becoming familiar with those was a shock -- now Kam Man seemed dirty and overpriced, and the produce selections pale in comparison to any of those three. 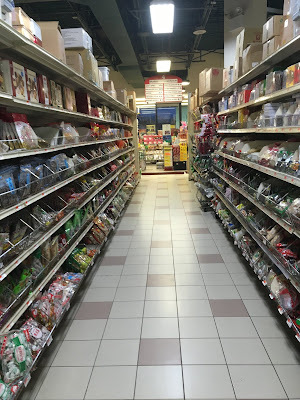 Neighboring Livingston (whose ShopRite we saw last week) has a significant Chinese population, and Kam Man is the only major Asian market in the immediate area. I wondered what others thought about the store, but after speaking to several people I know who are of Chinese descent, my new opinions were corroborated: none of their families shopped regularly at Kam Man, frequently opting instead for smaller mom-and-pop-type markets in nearby Parsippany. Generally, they agreed with my assessment: produce is expensive and of low quality, perishable departments are dirty, and dry goods (although the selection is excellent) are overpriced. You enter on the right side of the storefront and can turn 90-degrees to the right to immediately enter a bakery/food court area with seating in the front corner, or you can continue straight to enter the grocery department. Bulk foods line the back wall, with seafood and butcher on the back wall opposite the entrance. Produce is in an expansion on the far side of the store from the entrance. I do like the fact that all of the carts match, and they're all customized with Kam Man Food handles. Looking along the front of the store from the bakery towards the food court. These counters may be separate businesses, which is pretty common. Closeup of the bakery counter. At peak times (lunchtime on weekends), this case is completely full. Saturday nights are not peak times. If I remember correctly, this is the first aisle. A look at what Aisle 1 has to offer. You can also see the entrance just below. Products sold in bulk, probably to small shops and restaurants, are stacked along the back wall. Looking back towards the first aisle. The shelving is very different from the usual supermarket shelving. Mostly it's because there are more dividers and there's a metal rail along the front of each shelf, as are both visible in this photo. The flooring gets a little crazy over here in aisle 7. The store went through multiple expansions with minimal renovations each time, so this may have been something else previously. 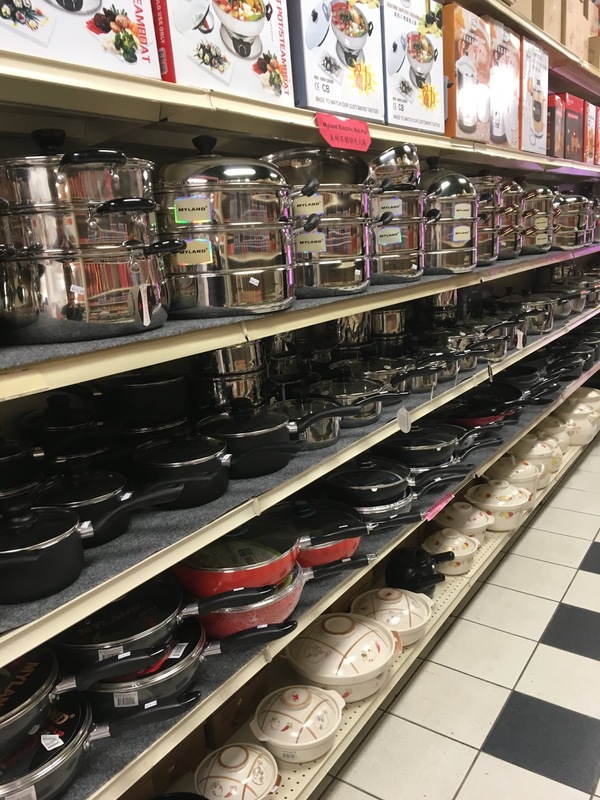 As with many ethnic supermarkets, Kam Man sells a wide range of home goods and kitchen appliances. This selection is located in one of the grocery aisles, with even more along the front wall next to the produce department. The single, solitary storebrand item I found in the whole place was this Red & White baking soda. 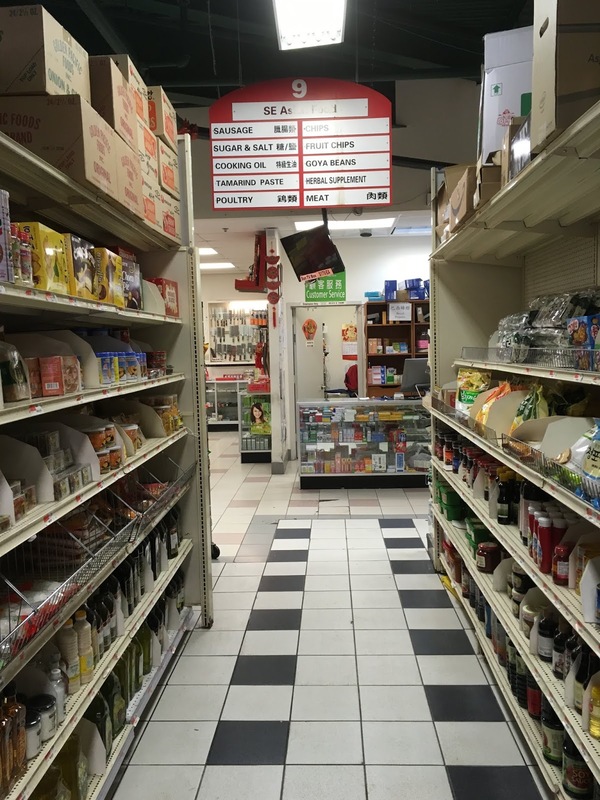 At least in the NYC metro area, Asian markets do not tend to use a storebrand. 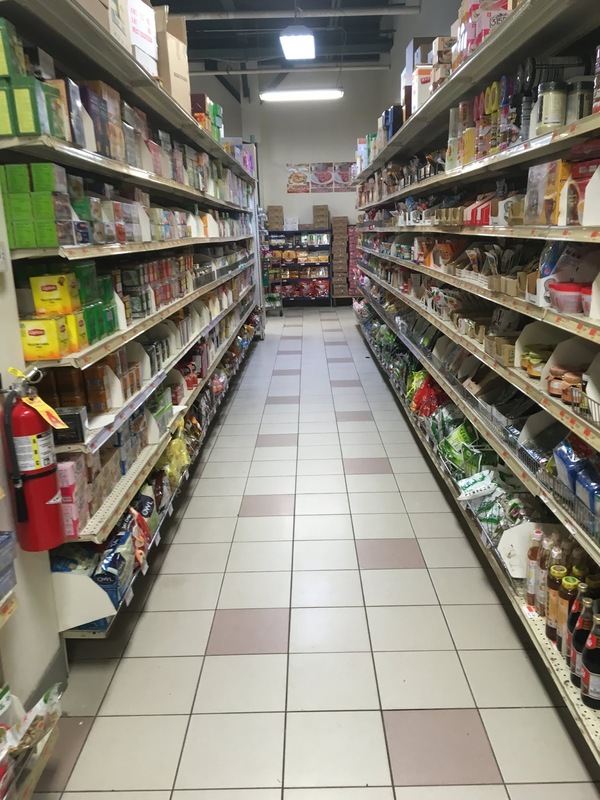 One of the last grocery aisles near the far side of the store. Also running in the grocery aisles is a small dairy selection, packaged meats, and frozen foods. Refrigerated goods in one of the last grocery aisles. Unfortunately, I have no idea what anything is here! Except the milk and eggs, of course. These refrigerator cases appear to be much older than the store itself is. It's possible, in my opinion, they came from the Pathmark across the mall, although I don't know if Pathmark ever used this type of fixture. Any input? Frozen foods aisle looking back towards the butcher counter. These cases also look fairly old, although I believe the dairy/refrigerator cases are older. Large nonfoods section in the front of the store. You can see where one of the expansions begins, where the ceiling changes height to the right. Butcher and seafood counter on the back wall. Although I'm not a health inspector, these sections didn't seem nearly as clean as the fish and meat departments at a Food Bazaar, SFFW, or Hmart. There was also a stronger smell, which there really shouldn't be. However, there is a larger selection of live seafood than those stores offer. 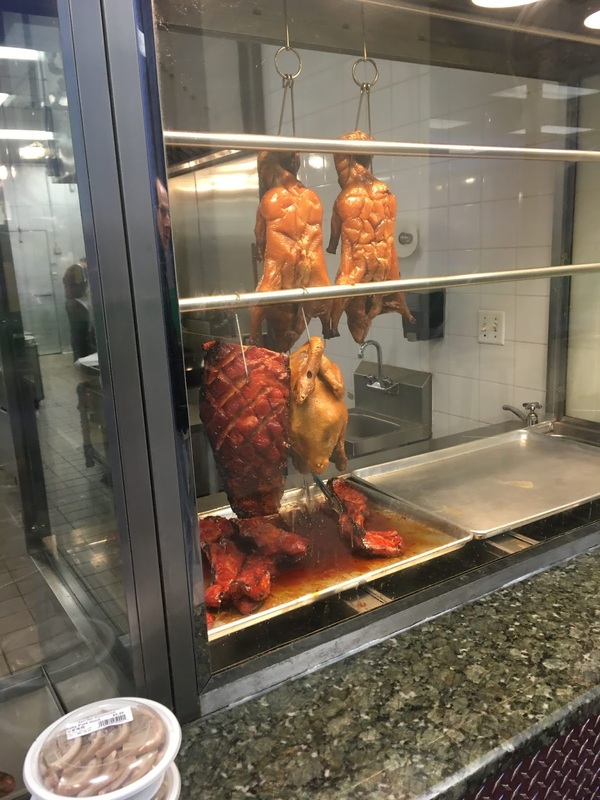 These crabs better be really fresh. They're sitting in a cardboard box with no refrigeration at all and no ice. That's fine, as long as they're not sitting there for a long time. If they are very fresh, this is the best way to buy shellfish! Looking back towards the grocery aisles. The front wall is to the right above. More cases that look older than the store itself, and the red and blue trim on this case suggests Pathmark to me (but again, I have no idea). I believe the man in the gray sweatshirt facing away from me to the right is a manager. Whoever he is, he managed to give me multiple dirty looks but did not approach me about taking pictures. It's possible he speaks little English. Looking over into the produce department, which looks pretty good from a distance. $3.49 for a single Asian pear, though? How about a three-pack at Food Bazaar for $5.99? I don't know, there's just something about paying $14.99 for a watermelon that turns me off. The greens (shown here on the side wall) did look great, but were again expensive (kale, for instance, is $1.99/lb, which is on par with ShopRite and $0.50/lb lower than ACME, but Food Bazaar is usually $1.29/lb and SuperFresh Food World is often $0.79/lb). Also, check out those Fine Fare price signs! Some more exotic produce towards the front of the store. Looking back towards grocery aisles. The strange floor patterns are, again, the result of multiple expansions. On the other hand, $1.99 for asparagus is really good! The pictures along the walls are a nice touch, although the area is still pretty dingy. Here we can see from the produce department along the front wall back over to the nonfoods section. More Fine Fare sale signs in this case along the front wall! Looking back from produce ($1.49 for a rock-hard mango? No thanks, I'll take the 5/$5 perfectly ripe mangos at Food Bazaar. Also, those romaine packages should be refrigerated) to seafood along the back wall. Continuing back along the front wall from nonfoods past customer service, visible straight ahead. Here's a closeup of the customer service counter, and a little view into the manager's office which happened to be empty when I walked by. A look across the front-end back towards the bakery/food court area. So I'm not sure what conclusions do draw from Kam Man. Sure, it fills a need because it's the only major Asian market in the area, but I don't think it's a particularly great store -- I just think it doesn't have any competition. Has anyone else been here? What do you think?